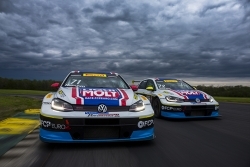 Milford, CT, January 18, 2019 --(PR.com)-- After a successful inaugural season finishing third overall in the TCR class of the Pirelli World Challenge, FCP Euro is extending their partnership with LIQUI MOLY for the re-branded TC America Championship in 2019. The team will again compete with their two 2018 Volkswagen GTI TCRs. FCP Euro's Marketing and Brand Director, Michael Hurczyn, will pilot the #71 while 2018 TCR Class Rookie of the Year and FCP Euro Director of Motorsport, Nate Vincent, will pilot the #72 towards their second season of professional touring car racing. What's even more impressive than the traditional racing sponsorship is the way FCP Euro and LIQUI MOLY have achieved record sales by activating customers at events and races to educate the end consumer on the very products that are used in the race cars themselves. "The 2018 race season was our first full sponsorship of a US race team. We very quickly learned how beneficial it is to have LIQUI MOLY branded cars on the track. It made a huge push in brand awareness and in new customer acquisitions. We also learned that race fans are hungry for information regarding our oils and additives," said Mike Crosby, Marketing Manager of LIQUI MOLY USA. "Working with FCP Euro on the 2018 race program was an absolute dream for someone in my position," Crosby added. "I have worked with all types of race teams over the years. It is a real pleasure to work with an organization that truly understands ROI. On top of that, the crew that works on the team are second to none. They bend over backward to make sure that sponsors have everything they need to make the most out of participating with the team. It is very rare to find an organization that understands both the on-track and off-track needs of sponsors." Excitement is high leading into the 2019 season both for LIQUI MOLY and FCP Euro. The TC America Championship TCR class is being split into two classes for the new season; the first being a full global-spec TCR class for cars with sequential gearboxes, and the second being a TCR Cup solely for the Audis and Volkswagens running DSG gearboxes. The FCP Euro Volkswagen GTI TCRs will be in the former category, after taking delivery of two brand-new sequential transmissions to compete with other manufacturers at the front of the pack for the top spot. "One of the core values at FCP Euro is 'continuous improvement' and we truly take that to heart," explained Michael Hurczyn, Marketing and Brand Director for FCP Euro and driver of the #71 Volkswagen GTI TCR. "We want to compete with the best of the best and installing sequential gearboxes in our cars will provide us with the performance we lacked last year competing among the Hyundais and Hondas." "We know the team will be even more competitive this year and we can't wait to see more and more podium finishes," added Crosby.